Today is National “Don’t Cry Over Spilled Milk” Day, so Lisa and Rabia decided to have Tuesday Ten be all about things that make us cry. 10. Onions. It’s true. Whenever I chop onions, I cry like crazy. It’s not just an old wives tale but a real problem. 9. People complaining about the weather. I know, I’m going to get in trouble for this one. Let me give you a little preschool lesson. What month is it? That’s right, it’s February. What season is it? Winter. Where do we live? Northern Illinois. We always have cold and snowy weather in February, and the last time it was unseasonably warm in March, the apple orchards got confused and we had a terrible local crop of apples. That made me cry, too. 8. Country music: See the following. A Pretty little girl and a beautiful wife. Take the heart from my chest. God, please don’t take the girl. To his Father in Heaven. 4. Hymns my mother sang. When we sing them in church, I can still hear my mother’s voice, singing as clear as a bell. And that makes me cry. 3. Watership Down, by Richard Adams. That last sentence kills me every time I read it. 2. Baptisms. Every time a baby is baptized at church, I tear up, and think about when my own two babies became children of God. 1. The Easter Story. The promise of eternal life and meeting God in heaven, along with my loved ones, makes me cry with joy. I am with you on number 9. It is still WINTER people. If the weather was like this in April, then we would have a good beef. Love this post! Sharon, The Mayor recently posted…Boycotting V-Day – Hmm, Really? Ok, I will stop whining about the weather. But because the kids got Thurs and Fri off, we do have a 6 day weekend! I cry over the news, those sad animal commercials (but I can’t go to a shelter either…we have 7 pets because I can’t say no), and anytime I think about family members and friends who are dealing with cancer. I cry a lot. Love your list! I never would have thought of adding music to a list like this, but I’d have to say that it would be a necessity. Well isn’t this interesting. I didn’t think my first posting went through. Hmm. Love your list! I never would have thought about putting music on a list like that, but I’d have to say it would be necessary. My husband once said that I cry at the opening of a door. I don’t think I could keep the list to just 10. Baptisms make me cry, too! Both baby and adult baptisms make me cry. It’s a beautiful thing! I LOVE Hey Pretty Girl!! And Don’t take the girl. I love country music, but it does make me cry! If you are really int he mood for a tearjerker, listen to “The Little Girl” by John Michael Montgomery. It’s old and I haven’t heard it in a long time, but I blubber like a baby every single time! Oh, so many songs make me cry – country songs are pretty good at that. I might be one of the people who complains about the weather – but only in the winter because I love the heat (and I did not choose to live in KS!!!). kim recently posted…Off my Game a Bit but Totally Nailed my Step Goal!!! I firmly believe that when you are at the right place for your spirit, you will cry. There is healing in tears. Great list! Oh wow there are few there that get me. Your number 1 – Jesus of Nazareth. I watch that movie and it gets me every time! Right with you on those country songs! Tears every time. 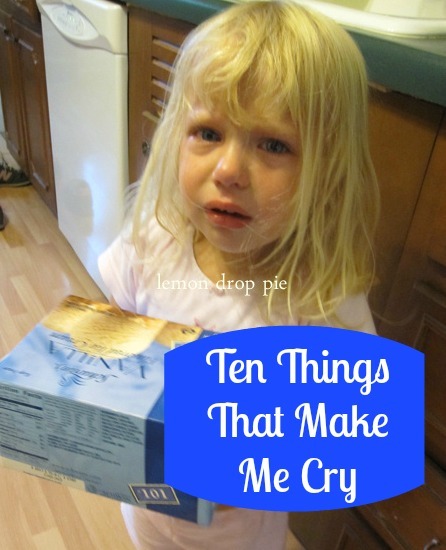 I could list all the things that make me cry, but you can read my post about it if you want! And the winter one is cracking me up. People seem really bewildered that winter is still here. In early February. In New England, where it’s often snowy until May. So yeah! tamaralikecamera recently posted…Have a Good Cry, Enter a Good Giveaway. Songs we sing at church! How did I forget to put that on my list? And I also love the country songs that you included – though I don’t know the one by Faith Hill so will have to look it up and have a listen and most likely a good cry. 😀 I loved your list! thedoseofreality recently posted…Would You Rather Give Up S-E-X Or Alcohol For 6 Months? I love Tim McGraw! And I’m so glad I’m not the only one who is going nuts with all the weather talk! There is a pray for healing that is sung at Shabbat services every week – I’m choked up by the second line. And Watership Down – I haven’t thought about that book in years. It was one of my favorites when I was growing up. I haven’t read it for a while, but it’s one of my all time favorite books! I am glad I’m not the only one breaking down at church on a regular basis!! And those country songs get me too. Country songs have always been tear jerkers! That’s okay if you don’t like winter; my rant was brought about by a stranger complaining to me for the whole time I was waiting in line for donuts on Sunday, and then the lady who sat next to me at church complained until the service started. I’m truly getting tired of it! Hachi, the film with Richard Gere. I cried like never before over a film (and I cry easily). A good choir with lots and lots of voices and a strong piece of music for them. I get choked up quite easily, can even cry over the smurfs! Oh, a good choir gets me every time! I cry pretty easily, too, and didn’t even write about everything because I didn’t want to cry!